“I did two Cream after-parties here in 1994. The Chemical Brothers did one, and Pepe [Roselló, the owner of Space] walked up to them after 10 minutes and said ‘You have to go off… now!’ and put David Morales on instead. It took me over 14 years to convince the Chems to come back after that!” So says We Love… Space promoter Darren Hughes, and it’s one of many excellent anecdotes (some printable, some very unprintable), that we’re told over the course of an extended chat with some of the key players behind the world’s greatest nightclub, Space. First opened in 1989, the iconic nightspot celebrates 25 years of existence this summer (hence our chat), and it’s no exaggeration to say that Space has changed the concept of clubbing as we know it. Sundays, for example, helped give rise to the birth of the 24-hour party, while the club has also acted as a springboard for the careers of Carl Cox, Steve Lawler, Sasha and literally hundreds of others. Yet while it’s now very much a state-of-the-art, 6,000 capacity super-club, back in ‘89 it started out with far more humble intentions. Much of what Hughes is saying goes some way to explaining the club’s still huge influence, and the likes of the aforementioned DJ Mag gong is testament to the constant graft that’s involved in running the world’s greatest club. 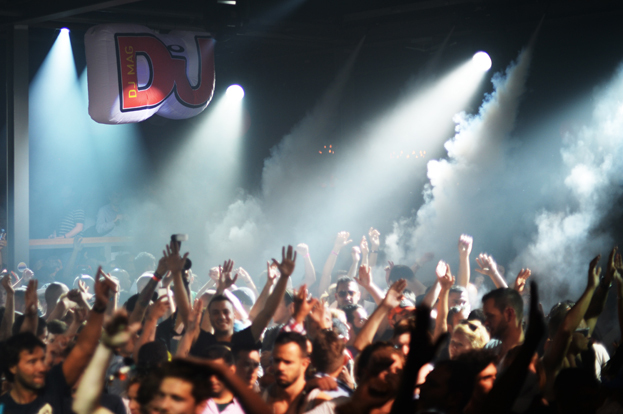 DJ Mag are sitting down with Pepe, Juan and Darren on Space’s famed Sunset Terrace, and barely a week into the 2014 season, we’re curious to establish quite how a club of Space’s proportions works. It’s merely a week after the Opening Party when DJ Mag catch up with the Space crew, and we’re keen to hear what they thought of this year’s edition. “The Opening Party is my favourite party — and this year was amazing again!” says Juan. “The people are fresh, everybody is in a good mood and all the island residents come out to play too. We have an extra area for the Opening and Closing Party in the car park called the Flight Club, which holds an extra 5,000 or so people, so they can all dance outside like in the old days. This summer, the area was supposed to open at 12, but we had some misunderstandings with the town hall, which meant we had to open at 4pm instead.